As reported in a recent post, Buster Keaton in Cops, Harpo and Groucho Marx in Duck Soup, and the 1947 murder noir classic Born to Kill, and the 1980s soap opera Dynasty (see YouTube at end of post), all filmed scenes at the Jewett Estate in Pasadena. 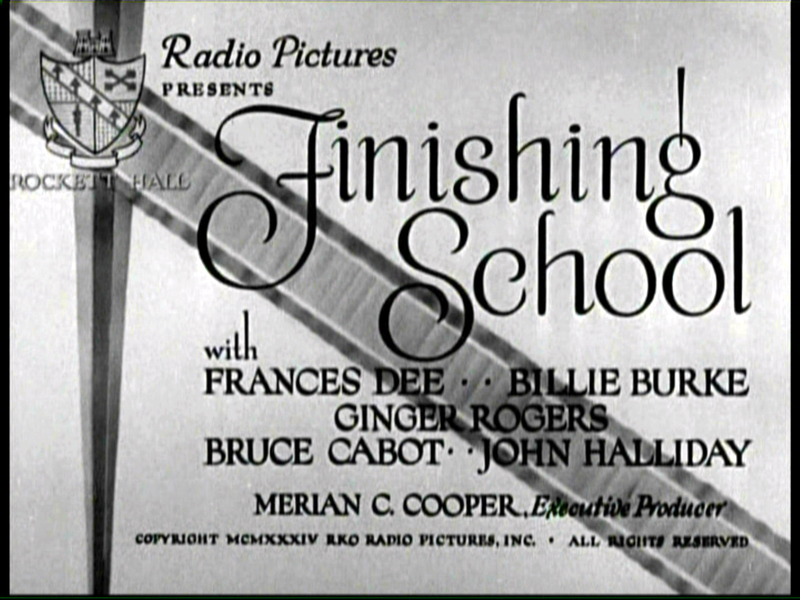 We can now add Lon Chaney (vicariously) and 14 year old Loretta Young in Laugh, Clown, Laugh (1928 ), and Ginger Rogers in Finishing School (1934) to the mix. As more classic films become available for study, the long list of productions staged at the Jewett Estate will continue to grow. 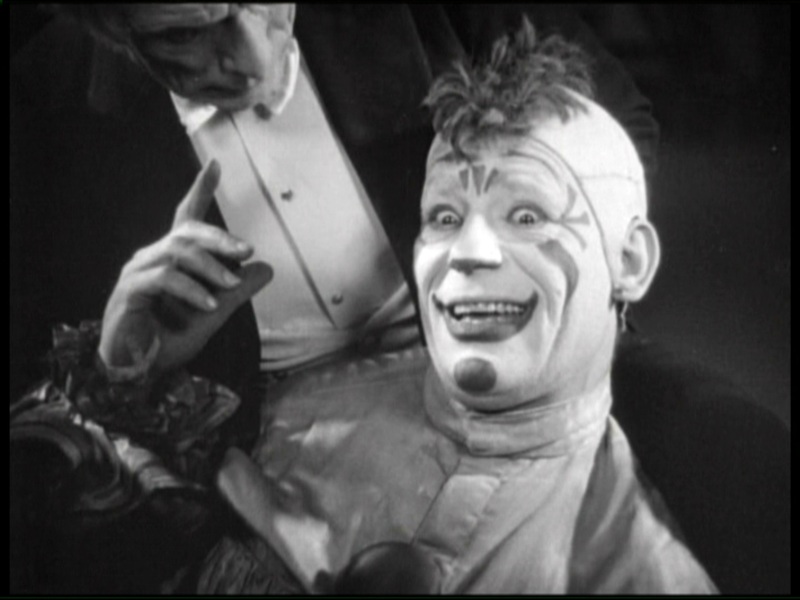 In Laugh, Clown, Laugh, Loretta Young plays an abandoned child found by clown Lon Chaney, who raises her in the circus. Early in the film, Loretta climbs a fence into the Jewett Estate looking to pick a rose, where she meets a wealthy count, played by Nils Asther, who is instantly smitten. Laugh, Clown, Laugh – Nils leads Loretta north from the Jewett Estate Lily Pool, matching this view of Groucho, Louis Calhern, and Margaret Dumont in Duck Soup (1933). 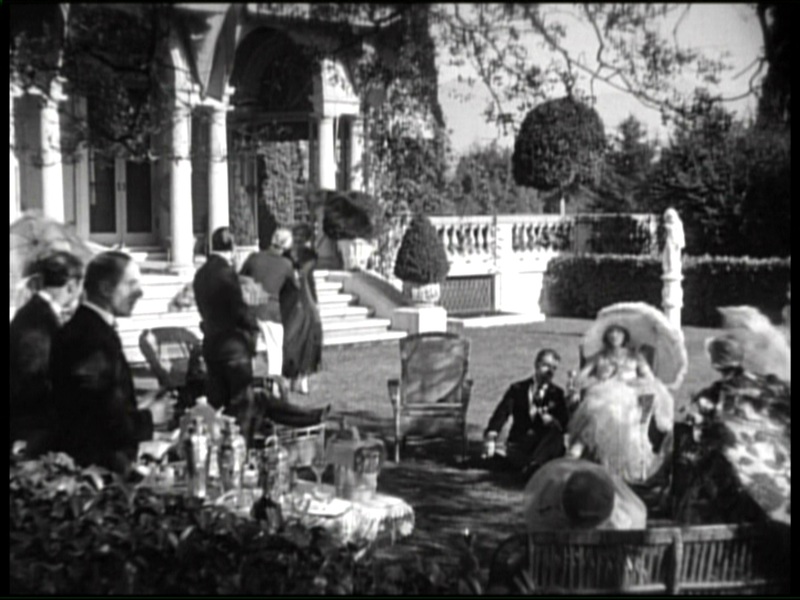 The same garden view, looking south from the Jewett mansion towards the formal Lily Pool, appears during this calisthenic class scene from Finishing School (below), where the estate portrays Crockett Hall, an exclusive boarding school. Morning exercise class from Finishing School at right. During this closeup of Ginger Rogers mocking her dance instructor, we see the same portion of a garden balustrade appearing with Groucho in Duck Soup. 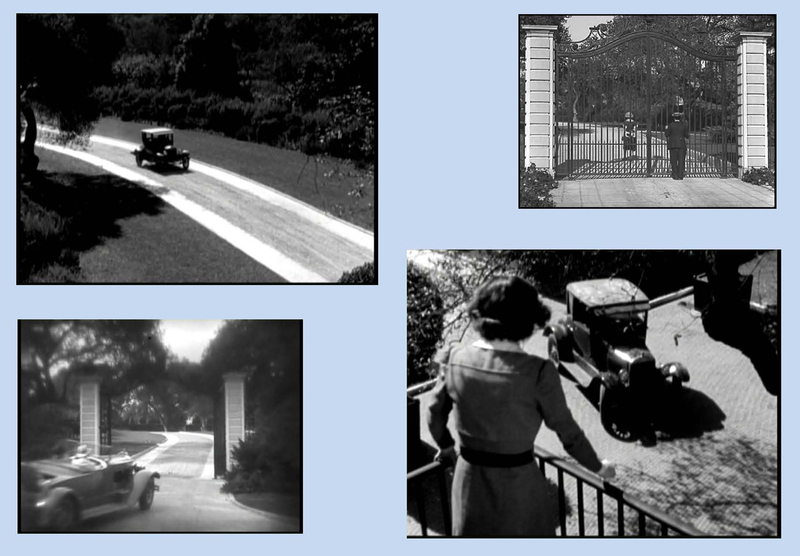 Finishing School also provides a “behind the scenes” view of the long driveway leading north to the mansion from the south facing gate Buster Keaton used in Cops (1922), and in the William Haines – Joan Crawford comedy-romance Spring Fever (1927). The upper left and lower right images from Finishing School suggest the full length of the driveway, which leads north from the gate on Arden Road appearing in Cops, upper right, and in Spring Fever, lower left. The lavish Jewett estate, located at 1145 Arden Road in Pasadena, has portrayed cinematic wealth and grandeur for nearly a century. Completed in 1915, the Palladian-style villa was once set amidst vast gardens adorned with Italian sculptures and fountains. 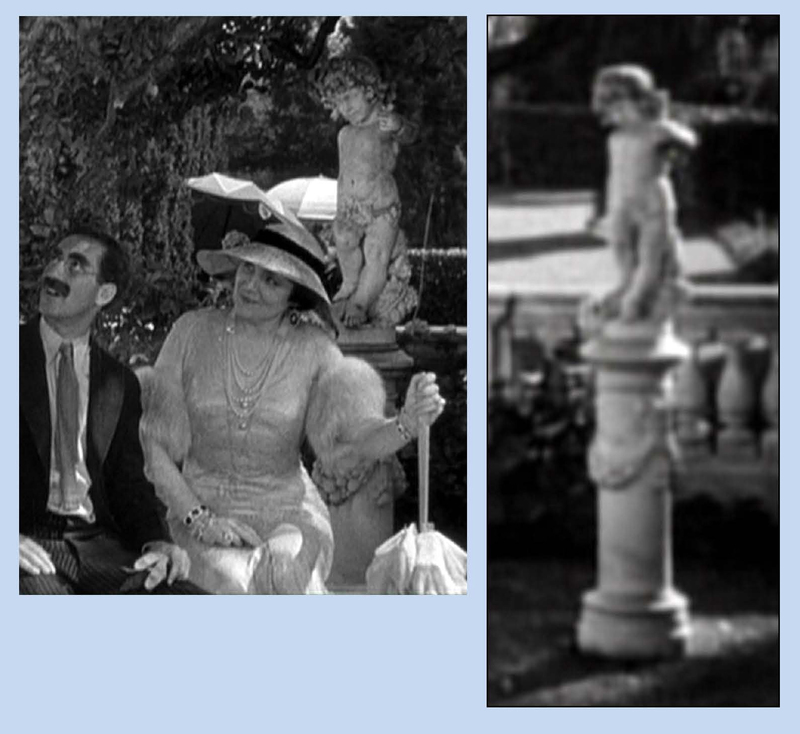 Below are matching details of the same figure appearing in Laugh, Clown, Laugh and in Duck Soup. The Jewett Estate would later become famous as a primary filming location for the 1980’s prime time soap opera Dynasty. This YouTube link shows the same Lily Pool as the setting for the iconic catfight between Krystle and Alexis. For more complete information about of the Jewett Estate, and many more photos, please see my previous post HERE. This entry was posted in Buster Keaton, Cops, Duck Soup, Jewett Estate and tagged Arden Road, Buster Keaton, Cops, Duck Soup, Finishing School, Ginger Rogers, Groucho Marx, Harpo Marx, Jewett Estate, Joan Crawford, Laugh Clown Laugh, Lon Chaney, Silent Comedians, Silent Comedies, Silent Movie Locations, Silent Movies, Spring Fever, then and now, William Haines. Bookmark the permalink. What a typical pose that was for Ginger Rogers! Deflating stuffed shirts with her particular brand of mischief was the trait (besides her dancing) that won her the hearts of so many moviegoers.